Needing a win, or a Bishop’s loss to Laval, Concordia left nothing to chance last Saturday at Molson Stadium, rolling over the McGill Redmen 58-30, and securing themselves a spot in the playoffs. In clinching the game, Concordia also won its ninth-straight Shaughnessy Cup match. 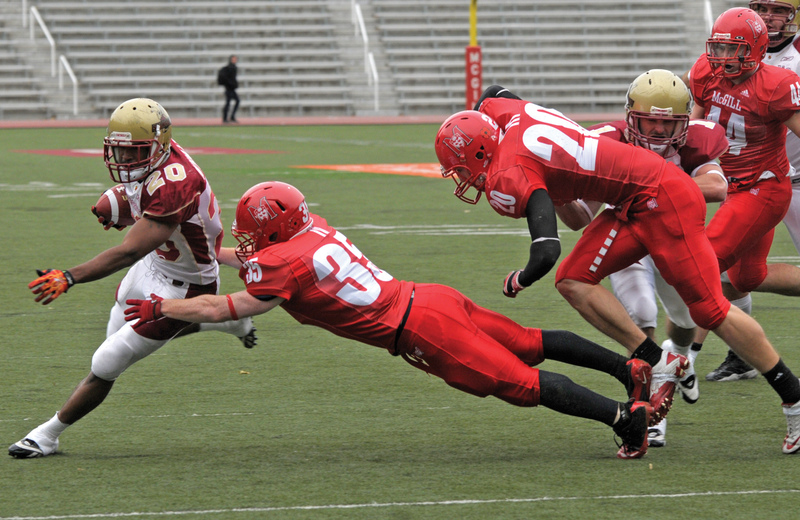 The annual football showdown between Concordia and McGill has been taking place since 1969. The Stingers were given a good fight by the Redmen in the first half, as they led by only three points heading into the second half, but 28 unanswered points in the third quarter sealed it for Concordia. Concordia is now heading into the RSEQ playoffs as the fourth seed. They’ll travel to Quebec City next week to take on the Laval Rouge et Or. Laval has already beaten Concordia twice this season, 36-8 and 37-4 in the two meetings. Both games were tough losses where the Stingers failed to score a touchdown in either meetings. As for the win over McGill, things started quickly for Concordia thanks to strong play on special teams from Kris Robertson. The halfback has been impressive all season, and after a two-and-out from McGill on the opening drive, Robertson returned a punt 45 yards to the Redmen’s 35. Raul Thompson scored on the very next play on a 35-yard run for the score. The Stingers and Redmen battled in the first half, with McGill looking to avoid a winless season. McGill’s Austin Anderson kicked a 43-yard field goal in the final seconds of the half to cut the score to 20-17. The Redmen had no answer for Concordia in the second half, as the Stingers moved the ball methodically with a short passing game. Concordia started the onslaught with a 14-yard touchdown pass to Sanchez Deschamps. On the next drive, they got the score quickly with a 65-yard touchdown pass to Michael Donnelly who caught the short screen pass and rumbled his way through and around the McGill defence to the end zone. On McGill’s ensuing drive, linebacker Max Caron intercepted a pass in the red zone to stop the Redmen’s threat. Concordia turned that into more points, as Reid Quest found Kris Bastien for a 40-yard touchdown pass. On the ensuing kickoff, McGill fumbled, giving the Stingers the ball at the McGill 25-yard line. Once again, Concordia capitalized as Quest hit Edem Nyamadi for a five-yard touchdown pass. Quest finished the game with 23 completions on 31 attempts, with 356 yards, five touchdowns and no interceptions. Caron made history in the second half, by breaking the RSEQ single season record for tackles, finishing the season with 78.5. In addition to that, he got his fifth interception of the season in the fourth quarter, and returned it 96 yards for the score. Caron’s two interceptions brought his season total to five. He finished the season leading the CIS in tackles, solo tackles (67) and interceptions, making him the hands-on favourite to win the Defensive Player of the Year award. McGill added some points late when the game was out of hand, blocking a punt for a score and a late touchdown pass by Ryne Bondy to Michael Chitayat. Bondy broke the school’s single game record for pass attempts with 65. Now Concordia will look for the huge upset on the road this Saturday. The odds are stacked against them. Laval may beat Concordia nine times out of 10, but all it takes is one win in football. Concordia takes on Laval in Quebec City on Nov. 5 at 1 p.m. in the RSEQ semi-finals.